discOveryOne from Keith Monks. Inventor of the original electric Record Cleaning Machine, brings the record cleaning quality so prized by the BBC, the US Library of Congress and the British Library National Sound Archive among others, in an easier and more affordable package. Keith Monks today announced that the new discOveryOne Record Cleaner had started production in the UK. It will shortly be available worldwide. Jon Monks – The Record Doctor – son of the founder, Keith, will be demonstrating the discOveryOne in Atrium Room 422 of the Denver Marriott Tech Center Hotel during the show. 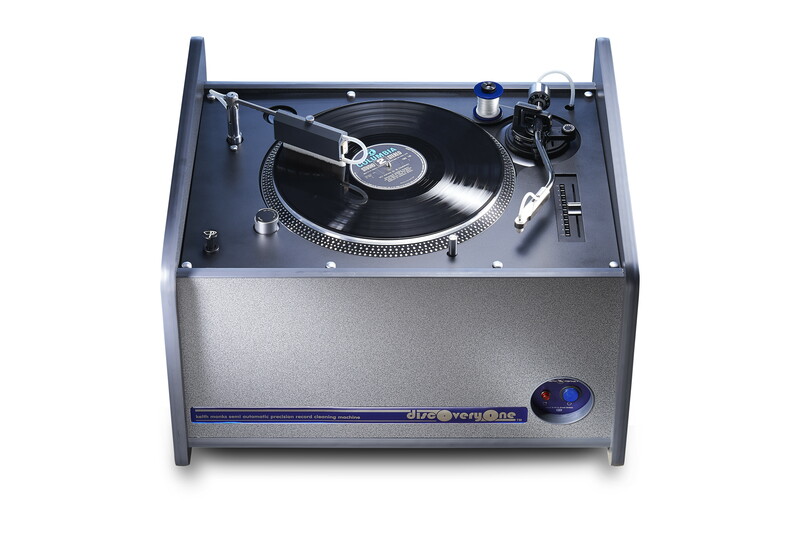 The timing of the launch is ideal: Vinyl record sales are growing worldwide and more enthusiasts together with younger people are finding, or experiencing again, that vinyl records deliver music and emotion that many playback systems seem to have missed. Pre-owned records are a fabulous source of music at often very attractive prices and here a record cleaner is ideal for restoring the best performance. Cleaning also improves the performance from new records as it removes the excessive mold release agent frequently left after manufacture. Keith and Jon both agreed on two key issues of record cleaning: Firstly the record must be cleaned efficiently without over stripping the vinyl of its natural plasticizers and secondly the experience must be pleasurable. Jon’s new design has stayed faithful to these original vital concepts while adding and enhancing a few of his own. Cleaning is a simple process of applying cleaning fluid and cleaning brush manually in the case of the standard model or using the Mini Cooper washer pump and classic Keith Monks precision wash system in the discOveryOne Classic. In both cases the cleaning fluid is fresh and previously unused for each record and the contact with the record during the precision vacuuming process is by a virgin piece of thread ensuring no contamination from previous records. The cleaner must be quiet enough to allow a record to be enjoyed while another is cleaning. Without this simple and obvious feature, record cleaning becomes a chore and fewer records are cleaned. The discOveryOne is the quietest electric record cleaner (37dB C weighted 1metre). * Whisper quiet medical grade diaphragm suction pump – a compact version of the BBC specification vacuum pump. * Auto shutdown if the waste container is full. So the obvious question is: if this Record Cleaner has all the features and benefits of the significantly more expensive professional version why will anyone buy the pro version? It’s a simple answer: Duty Cycle and speed. The professional versions are faster and designed and built to be able to be used all-day and everyday, if required, in the sort of environments that don’t exist in enthusiasts’ homes. discOveryOne is, perhaps, best described as high-end consumer: designed for hours of everyday use in the home, its built in protection systems preventing overuse. It can be left to shut itself off after each dry cycle.